Dhoni's experience time and again comes to India's rescue. New Zealand got off to a blistering start in the first T20I in Wellington after being put in to bat by India. The duo of Tim Seifert and Colin Munro blunted the leather brutally to add 86 runs for the first wicket and put the visitors on the back foot. Krunal Pandya was the one who got India their first breakthrough by accounting for the latter’s scalp and it was once again MS Dhoni who had come to the fore for the Men in Blue. The Kiwis were sitting pretty at 86/0 after eight overs as the Indian bowlers were looking hapless. The ball was handed over to Krunal who was in the middle of a decent spell. Before the start of the over though, MS Dhoni was seen having an elongated chat with the left-arm spinner. The second ball of the over saw Krunal bravely tossing up the ball to Munro outside the off-stump as the batsman tried to club it over long-on. However, he got his timing wrong and ended up spooning a catch to Vijay Shankar who was fielding in the deep. 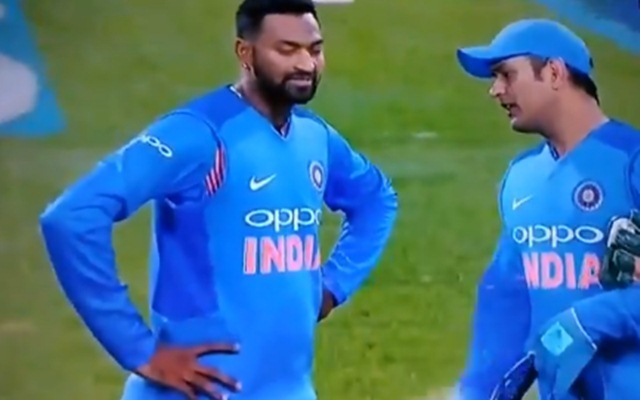 It was a huge wicket for the visitors in the context of the game and the discussion between Krunal Pandya and MS Dhoni had worked wonders for Team India. The duo of MS Dhoni and Krunal Pandya came to the fore for India with the bat as well. They came together at 77/6 when the result of the game was no longer suspense. Moreover, one of their worst defeats was surfacing for the World Number two T20I side. But these two batsmen added more than 50 runs which did nothing but avoided the ignominy of a huge loss in terms of runs for the Men in Blue. Eventually, India got bowled out for 139 runs in the last over losing by a massive 80 runs.